The drop in water temperature in late august and september brings schools of chinook salmon into the river and provides anglers with some excellent fall fishing. The salmon come into the river to spawn and aggressively hit baits such as: roe fished on bottom or under floats, brightly coloured J9 or J11 Rapalas, cleos and other small spoons. In the spring, opening of steelhead fishing attracts hundreds of anglers to the Ganny. The water in pools south of the Corbet Dam receives most of the fishing pressure. When the water is low and clear, the bows holding in the lower sections of the river are spooked and closed mouthed by sunrise, and anglers have a tough time getting them to bite. North of the dam, the fishing pressure is also extreme on opener with anglers crowding any pool that holds fish. The most popular pools are at Sylvan Glen which produce a large number of fish. The most productive baits are roe bags with 2-4 eggs per sac and small dark coloured flies drifted 1 foot off bottom. Early morning is usually best. 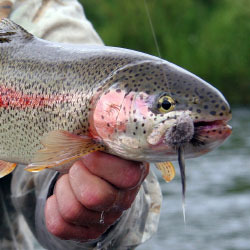 Some anglers also use small red worms and wooly bugger flies. Being persistent will produce a few fish even with the crowds. In the fall, concentrate your efforts in the lower river mouth area. This section from the CNR bridge south produces some of the best fall fishing available. 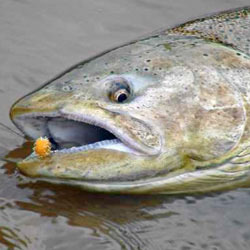 Floats and roe bags are the norm in the river with pier anglers giving the nod to floating roe bags. Each detailed map provides depth, contours, structure, boat ramps, and updated fishing information. Ganaraska River fishing maps also include lake info such as gamefish abundance, forage base, water clarity, weedline depth, bottom composition, complete latitude/longitude grid lines and dozens of GPS waypoints & coordinates.